One hundred percent chocolate separates fine chocolate makers from those who merely make chocolate. 100% Chocolate. Chocolate with absolutely nothing to hide behind. There is no sugar or sweetener to mask bitterness or poor quality cacao beans. No inclusions to hide texture issues or acidity. Other than the possibility of extra cocoa butter, one hundred percent chocolate is nothing but bare naked cacao as it was fermented, roasted, and crafted into chocolate. One hundred percent chocolate is gaining popularity. I should have seen this one coming. More and more people are reducing or eliminating the sugar in their diet either for medical reasons or by personal choice. People don't want to give up chocolate which leads to the rising demand for chocolate without sugar or sweetener. I understand on so many levels. For most people 100% chocolate is an intense experience, especially when tasting it the first time. Some find it easier to think of a savory experience similar to tasting tea or coffee. To avoid palate overwhelm sample tiny samples, much smaller than a typical tasting size. Taste the same chocolate several times at different times of the day and under different circumstances. I find that different times and circumstances change the way I perceive chocolate. I record only the textures and flavors I sense, not my personal like or dislike of the chocolate as a typical review might. Why? 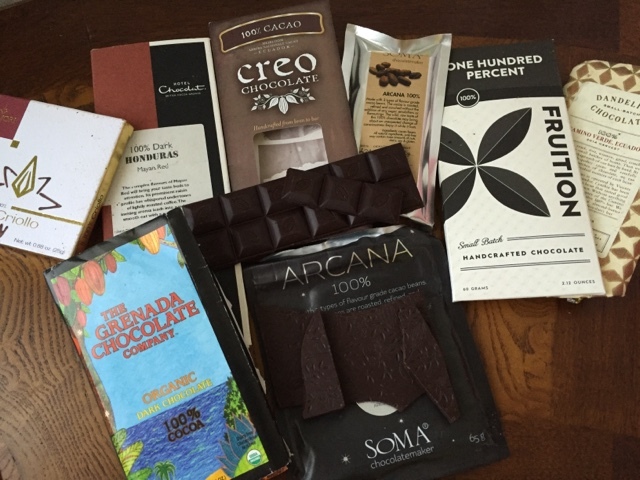 Because palate training and tasting is different for each of us, you may have an entirely different experience than I do with the same exact chocolate. That, my friend, is the beauty in craft chocolate. With 100% go slow and keep an open mind. I started with a blind tasting of all the bars, followed by tasting each bar several more times in groups and alone over the next several weeks. I kept a journal and recorded notes for each tasting including texture and flavor development, then consolidated my most frequent comments into what you see below. New additions. Everywhere I go now my 100% radar seems to be on high alert. I'm finding more and more bars, meeting chocolate makers who are tinkering with 100% recipes. I've put some notes on bars that were not a part of the original blind tasting below too. Smooth melt. Earthy, slightly astringent and sour. Walnut and walnut skin finish with woody notes. Chalky melt start that turns to putty with a slight bit of a dry powdery texture. Notes of soot and yeast. Smooth texture starting with fruity, earthy, and oregano notes. Finish is bitter with fruity acid and a late dry astringency. Smooth melt into liquid. Woody with fruit, mold, and dirt. Finishes bitter and soap. Silky smooth velvet slow melt. Woody and earthy with roasty cherry fruit notes. Finishes with charred and roast notes and bitterness. A bar with thick slow melt. Grape and yeast notes. Finish with deep, dark roasty notes and slight bitter. Quick smooth melt. Herbal notes that tend toward mint or basil. In the finish more fruit and roast appear. Smooth velvet texture. Earthy and sour notes that remind me of a mild cheese. Finish with roast and mushroom notes. Perhaps a touch of tire rubber too. Texture that is smooth and alluring. The flavors start with high acidic note. Plum and tart cherry. Moves into raisin and honey notes. Reminiscent of a bold red wine. Almost balsamic finish. Smooth super creamy texture. Earthy bitterness (mild bitterness that makes you want more). Flavor notes reminds me of bananas and maybe some citrus. Blind tastings must be a social function as you will require assistance. Someone who cares enough about you and your crazy chocolate passion has to help set up a blind tasting so that you can enjoy the chocolate without knowing what you are tasting. This type of work involves thought and creativity. I owe a big thank you to Jazz, who did a fantastic job of setting up the blind tasting for me. All chocolate samples were labeled as characters from Harry Potter and all evidence of the maker of the chocolate was removed. P.S. Stay tuned...I'll have more to say about 100% in the very near future. I read Domori will launch a line of 80% and 90% cacao bars next September. I find 100% cacao bars interesting, especially for someone like me limiting sugar, but maybe just a bar with higher chocolate percentages than 70% can be the right compromise. We only need to be careful that it's just cacao mass, as extra cacao butter concurs to make up the final cacao percentage. No, Barbie, but I will look for it! You made me curious! Thanks! I forgot to say that French Broad Chocolates launched a 100% cacao bar last February, along with other origins and their new eye-catching packaging. I tasted it and it's really earthy, but balanced. It's just cacao mass, no extra cacao butter, and a mix of six different cacaos. Those guys are really passionate in chocolate. The people behind French Broad are some of my favorite chocolate makers. I know someone who will be in that area soon, I'll have them pick up a 100% bar for me. Thanks for the tip! Interesting read! I'm personally not really a 100% fan, however slowly but surely i'm beginning to at least be fascinated by it. From what we sell ourselves in the Netherlands (as Chocoladeverkopers) i'm quite impressed by the taste of Amma, Akesson's and Morin Peru 100%. I've never tasted Tibor but I'll start looking for them. Please let me know what you think when you taste them. You live in Seattle and you do not have Fresco's 100% Madagascar in your stash? Shame! (I do rank them, and it usually wins.) Happy Hunting! Thanks Kurt! I will have that Fresco bar soon! Stay tuned!